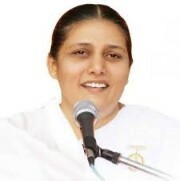 Facilitator: BK Sister Usha is a senior Rajyoga Meditation Teacher for 40 years from the Brahma Kumaris International headquarters in Mount Abu, India. She is also a Self Management Leadership Trainer and speaks Internationally on spirituality with modern management philosophy. Sr. Usha works with many top companies in India and abroad and has made thousands of presentations to Colleges, Universities, Medical Associations, Social Organizations, Management Firms and Corporations. Sr. Usha is one of the main speakers on several TV channels. Her lectures are being telecast on Sony, Zee TV, Jagaran, Sanskar, Aastha, and Sadhana channels in India.